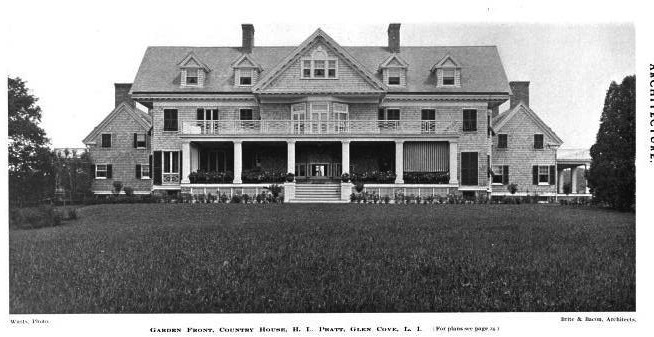 The first incarnation of 'The Braes', the Herbert L. Pratt estate designed by Brite & Bacon c. 1900 in Glen Cove. Click HERE for more on the second 'The Braes' designed by Brite & Bacon c. 1912 on the same site. A man's home is his tear down. Very handsome (to me). Even today we see people build, although usually buy, a nice house on a nice lot / acreage only to soon decide something "more fitting to their position" is needed (today that usually translates to "we just needed more room"). What always throws me off here is the scale of the first house. The Herbert Pratts seem to have suffered from a severe case of residential ADHD. They built this iteration of The Braes, only to tear it down and start anew 12 or so years later. In Brooklyn, they built a large townhouse along about 1906, and abandoned it in 1914 for an apartment at 640 Park Avenue in Manhattan. A year later, they left that to move to a full floor at 907 Fifth Avenue (half of which is currently owned by the Huguette Clark estate). Less than 10 years later, they decamped for a townhouse at 1027 Fifth Avenue. after Mrs. Pratt's death, Herbert Pratt would move first to 4 East 66th Street and finally to 834 Fifth Avenue. 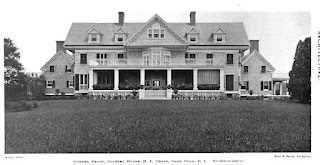 Along the way, the Pratts also acquired Frederick Vanderbilt's Japanese-esque Adirondack camp, as well as a shooting plantation in Georgia. Stated here as one man's opinion: I actually prefer this first iteration of The Braes. I find the second version too tall, too inhuman in scale and almost municipal in appearance. It looks exactly appropriate for the school it became. I have stood on the massive terraces in front of the current house, trying to imagine what the place looked like when they were fully landscaped. It's hard to imagine that it ever looked anything but overly massive. 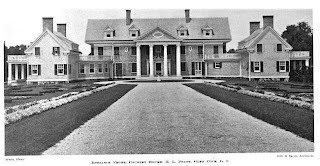 Maybe one of the Pratt descendants has a shoebox of old pictures of the first house. It would be great to see it with people on the lawn, or with the sea in view. Ancient- Many years ago, a niece of Florence Gibb Pratt sent me a studio portrait of Mrs. Pratt. When the Passortland photo in your link was published, I was rather suprised to see that Mrs. Pratt had used that same studio portrait for her passport picture. It put me in mind of my current passport photo which looks like a mugshot following a DWI arrest. I have contacted several Pratt descendants as well as Charles Pratt and Co. which manages money for many of the Pratt descendants hoping to locate that shoebox. Alas, no luck so far. Much prefer the architecture of the current Braes although the first home had its appeal too. Here the site, with its fantastic views was just too valuable and spectacular to move from so they just built alittle bit bigger. Also nothing wrong with moving every 3, 4, 5 years, plenty of people do it all the time when they get the itch to move once their home is absolutely perfect and finished, just to start all over again with a new property. The lake may be remote, but it is hardly antisocial... Fred Pratt once donned his tuxedo and water-skied to a formal dinner at Wild Air without damaging his outfit. Have always preferred the old house to the new, considering the genre of weekend country house. So much easier to picture the ladies of the house on those generous porches, white muslin dresses blowing in the generous breeze, croquet on the lawn, etc. Cannot conjure the same picture anywhere on the grounds of its successor. It is not beyond the realm of possibilities that such a house would be constructed today a la Robert Graves, for example; any ideas on the cost? I think this is my favorite of the Pratt houses. Beautiful (but without useless ornament), comfortably large (but not big for its own sake), magnificently sited, and -- best of all -- distinctively American. To tear this down after just ten years and replace it with something distinctively foreign, gratuitously large, visually jarring, and at odds with the natural landscape was just a very expensive mistake. And Ancient- 20 years after the enormous expenditure to build the second iteration of The Braes, it must have been apparent even to a man as rich as Herbert Pratt that he had built him self a proverbial white elephant. I remember reading in one of Herbert Pratt's obituaries written at his death in February, 1945, that the The Braes had been a showplace in its heyday and the gardens famous. It was very definitely phrased in the past tense. 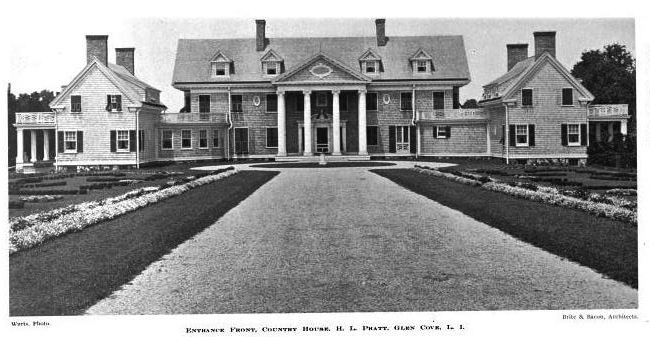 I suspect that the War permitted or forced many families to face the facts of a very different future for these enormous, labor intensive properties and to undertake maintenance cutbacks that were not, in the case of the Pratts at least, purely financially dictated. I once tried to explain to a reporter why a house that had thirteen live-in servants before the was impossible to maintain afterwards. He had assumed it was all about money. But it wasn't that at all. After the war, men didn't want to work as servants any more and women had got used to working in stores and factories. Too bad Charles's attempt to lock up the capital for his grandchildren was subverted, eh? P.S. Mme. Chaing Kai-shek may have been one of the last people to live in Manhattan with a huge number of personal servants. After WW I and definitely WW II one could not staff these properties. Owners couldnt upkeep large homes with an ever shrinking servant population. Private sector jobs were becoming plentiful. I'm sure many estate owners quickly realized their homes were not sustainable for their families as they surely had planned. and all that change happened so fast..Paradigm shifts.